A Rose by any other name is this week’s PhotoHunt theme or challenge, as I like to call them. I often talk about the garden the peeps used to have before they moved to the condo life we have now. 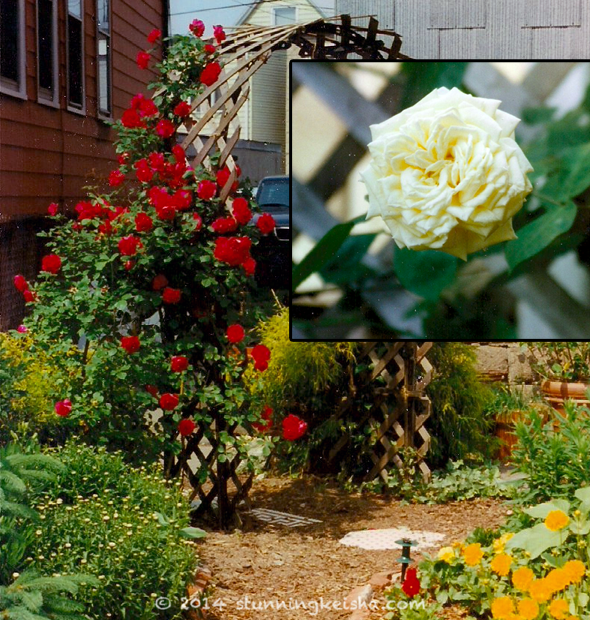 They had a huge yard and one of the flowers they grew were roses. There were pink ones, yellow ones and red ones. TW never did find any black ones or they would have had those too; although she did find and plant black tulips. Conversely, one of her favorite bands of the mid-‘90s were a group from NYC called Madder Rose. TW reviewed their second CD when she wrote for Forum. As I like to think of this as a musical blog where I can share tunes with you, here are Madder Rose with one of their mellower songs, Panic On. 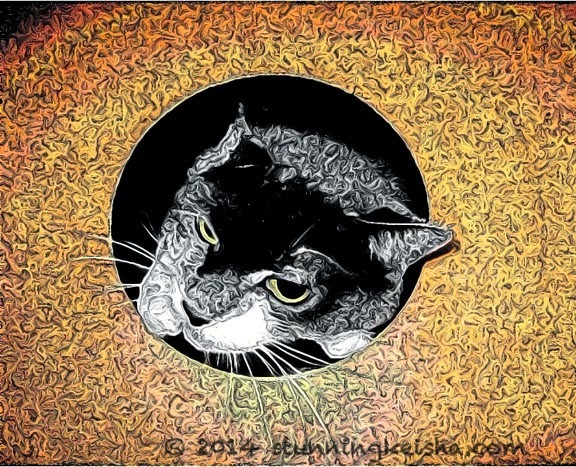 Once again Athena and Marie have their Caturday Art Blog Hop in full swing mode and you’ll find my entry below. Click the link to see all the entries or to participate. My first thought was to stay with the theme and go with a rose frame or something like that. Then I decided to put TW to work. Heh heh. First we found a suitably blurry photo which given TW’s lack of photography skills isn’t hard to do. This is one of the only photos of me inside one of the Catty Stacks that I won at Blogpaws 2013. I ordered TW to take it into Photoshop and experiment. In the middle image, she applied the Ink Outlines filter. For the next image, she posterized it and made it glow. You can bigify the collage for a better look-see. Finally, we took it into my fave online program and used the cartooned paint effect. Seriously, you can get this effect with any online program. I think I like it. I got curly furs! You certainly can’t tell the original was blurry. What’s the verdict? Do you like it or did I overdo the effects? No we think it is cool CK and shows off all your stunningness. Have a super Saturday. Good Effect, Miss CK ! In some how...you look like have curly fur !!! We think you look way cool CK!!! We love the cartoon effects...so cool! And those roses were almost as stunning as you! Not overdone! We really like the curly effect. Coco kicks the curls, fur real...but you are lookin' quite exotic with those effects! I think the more effects the merrier! Hmmm black roses would be cool! We have lots of interesting ones here. Ones that are white and red mixed together, or pink and yellow... I think your photos look cool and it's a pretty cool idea to do it with a blurry photo. I think you look lovely with curls CK. I think you look lovely all the time too. My mum said she hasn't heard of Madder Rose, but she has read Rose Madder by Stephen King. you got a perm!!! BFGF how cute!! That's a cool image and I think it's very creative applying multiple effects. Hopefully my mom will learn how to do that. Yous look gweat CK. Pawsum job. That's a cool effect, CK. And it does look like you have curly furs. You totally look curly, CK. We think that's a neat effect! And meowmeowmans remembers Madder Rose, by the way! We think you look like Mommy's crinkle tie-dye. Well, I always like you best au naturel of course, but the effects are fun and it's an=musing to see you with all that curly-furs! Sorry to be scarce--the Human is sulking and says the tiny Chromebook gives her a headache. Sigh. You commented on my blog about using blurry photos. I took a couple really blury selfies that I might share. There's a bit crazy though. We really like it, very cool! And beautiful roses that TW and Pop grew. We would really like to see black tulips...we didn't hear of them before. The garden your peeps had before condo life is very lovely. The roses are beautiful! I like this wild image. It looks very mysterious. Is CK coming through an outer space worm hole or maybe a bagel? i LOVE LOVE LOVE black roses and black tulips! A rose is a rose is a rose...I forget who said that! Woah! Love that last photo!